Team Forget Me Not is walking for their fifth year in a row to support the programs and services that help all those living with Alzheimer's disease or a related dementia. In 2014, author Amanda Bernardo and ilustrator Samantha Clusiau-Lawlor founded the social enterprise Little Voice Books to educate children, and adults alike, by creating awareness for causes and initiatives through the power of literature and illustration. Proceeds from their children’s books are used to support programs and charities throughout Canada, including the Alzheimer Society of Canada (Forget Me Not Project) and the National Canadian Mental Health Association (Be the Light Campaign). Through the Forget Me Not Project, Little Voice Books has been able to donate close to $8000 dollars to the programs and services making a difference in the lives of those living with Alzheimer's disease or a related dementia. This work has been inspired by Amanda's grandmother who is currently living with Alzheimer's disease, Teresina Bernardo. 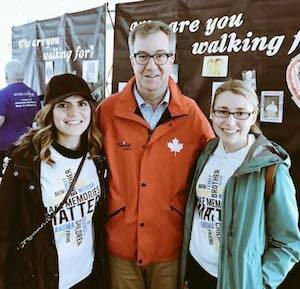 Each year, the Team commits to furthering their support by getting directly involved with local fundraising efforts, including The Dementia Society's yearly walk. By walking each year, the Team hopes to continue to raise awareness for Alzheimer's disease/dementia and add to the fundraising efforts that are making a difference in our community. Whatever you can give will help – it all adds up! We greatly appreciate your support and thank you for helping us to reach our fundraising goal.